The Foreign Affairs Committee of the United States Congress held a hearing on March 18 on the subject of US-Taiwan relations on the 35th anniversary of the Taiwan Relations Act, a hearing they chose to title “The Promise of the Taiwan Relations Act”. It may have just been semantics, but the use of the word “promise” in the course of the discussion seemed to reflect less of a sense of the opportunities created because of the legislation than a literal promise made between the United States and the Republic of China. Wading through the purposeful obscurity that so characterizes the relationship between America and Taiwan, it is hard to arrive at an answer to a very important question: what exactly is the promise that the United States of America has made to Taiwan? When I was at the protests at the Legislative Yuan in Taipei the week they began, I witnessed a man speaking about the resilience of the Taiwanese throughout their history in the face of constant takeover by imperial and colonial powers. He likened the current struggle against the Cross-Strait Trade Service Agreement to this history of resistance, but he made a comment that piqued my interest. He told the crowd that concerning the growing threat of a Chinese takeover that China was too big, and that the Americans could not save Taiwan now, it was Taiwan that would have to put up the resistance itself. Was this true, I wondered? Had the much-talked-about growth of China reach a critical mass, to the point where the Americans would decide that, in the face of an attempted takeover, Taiwan was simply not worth fighting Beijing over? The relationship between America and Taiwan is not simply a curiosity, it is a relationship that has proven to be absolutely critical to the develop of Taiwan into what it is today. It is a relationship that both sides of the debate over the Trade Service Agreement have acknowledge to be vital to the success of their vision of the future in Taiwan. Early in the Sunflower Movement, student protests sent a letter to the White House urging President Obama to support their occupation, and on the same day that President Ma of Taiwan held a video conference with a major American think tank on the US-Taiwan relationship, the leaders of the student protest held a conference with students at the George Washington University vindicating their point of view (the English version of which can be viewed here). The relationship between the United States of America and the Republic of China is a unique one. One has simply to spend a few months in Taipei to see how much of an influence American fashion, language, and entertainment has on the culture and self-identification of Taiwanese people of all ages. On the American side, there is constant discussion of a sense of “shared values” with Taiwan, a nation that has moved from being merely a strategic partner in the containment of communism to a nation that shares the values of multi-party democracy and free market capitalism with the United States. However, the relationship is also at times an ambiguous and uncertain one, especially since the de-recognition of the sovereign status of Taiwan in favor of the People’s Republic of China in 1979 by the Carter administration. Since that time, all decisions made by the United States with regard to Taiwan have always been made with Beijing in mind, something that causes quite a bit of anxiety amongst the Taiwanese. Though the United States did sail an aircraft carrier group through the Taiwan Strait in 1992 in response to the launching of missiles off the coast of China in the direction of the island, conditions twenty-two years ago are much different than they are today, and China occupies a much more potent place in the international system. The Americans tend to tread a very thin line when it comes to the issue of Taiwan, a position that may not always be viable even in the near future. They continue to sell billions of dollars of weaponry to the Republic of China, but the decision to scrap upgrades to Taiwan’s aging F-16 fighters and its subsequent reinstatement amidst China’s 12.2 percent defense budget increase shows how tenuous the relationship can be in times of contention. The United States claims that its relationship with Beijing is fundamentally based on the assumption that there will be no forced solution to the Taiwan question, but allows Taiwan to be further diplomatically isolated by China’s growing diplomatic influence. The fact that Taiwan has become so dependent on Chinese trade that it needs to pass these very controversial cross-strait trade agreements is due to the fact that Taiwan is not allowed to join major trade organizations like the Trans-Pacific Partnership, which the Americans formally support but have not advocated. All of these tepid signs of support as Taiwan becomes more and more dependent upon China economically are worrisome to advocates of Taiwanese self-determination on both sides of the Pacific. The promise that the United States made to Taiwan in the Taiwan Relations Act seems to undergo constant reinterpretation through the lens of America’s support of China’s “One China Policy”. If indeed the Americans are such staunch supporters of democracy and human rights in East Asia, perhaps it is time to make more concrete assurances to Taiwan, and for Taiwan in turn to assure the United States that it will be a responsible partner in the region. 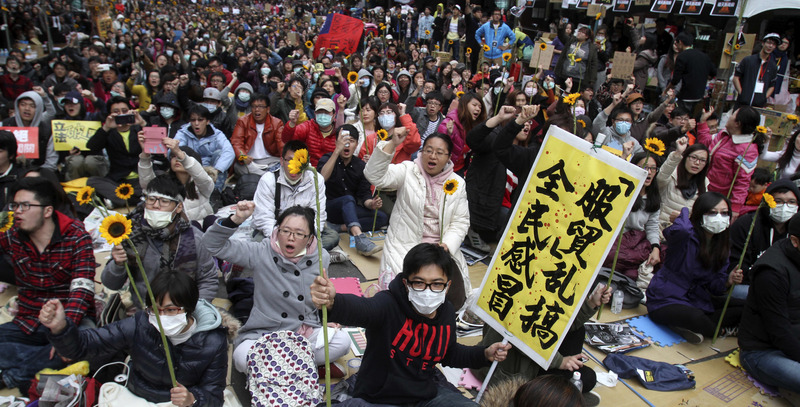 While I commend the comments I heard at the Sunflower movement protests about the indomitable spirit of the Taiwanese, spirit is not an effective missile deterrent, nor does it stop Chinese acquisition of Taiwanese businesses. Ideally, Taiwan would be able to share an equal burden (if not the full load) of the defense of its self-determination, but realistically Taiwan will never be able to defend itself against China. It is inevitable that Taiwan’s defense will always have to be subsidized by its friends who are stronger diplomatically, economically, and militarily. It is important for both America and Taiwan to remember, however, that theirs is not a relationship built simply on strategic necessity; both sides share a fundamentally compatible world view, and despite their cultural differences, they are allies in containing the growing power of China in the Asia Pacific region.